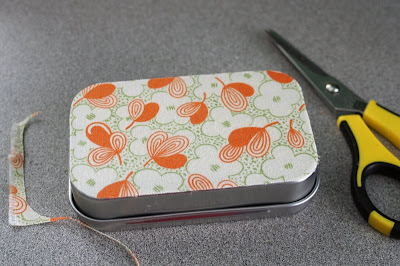 I had a few of these cute blank Altiod-like tins laying around and I thought they would be perfect little containers for sewing or knitting supplies. 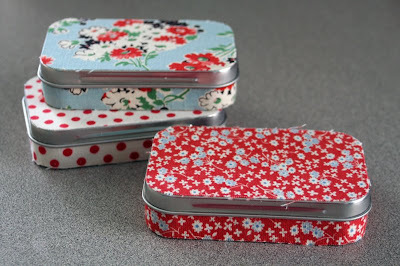 So I covered them in fabric, lined them with felt, and I have cute little tins to store my supplies in. Super simple, but here's how I did it. 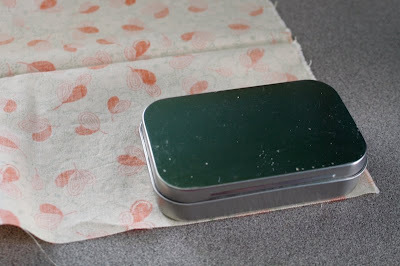 Spread Fabric glue onto one side of the tin. When slightly dry, trim extra fabric off of tin. Now starting in the back, apply glue to edge of bottom half of tin, attaching the fabric as you go around. (I used the selvage along here because it doesn't fray, but I'm sure regular fabric strips would work just as well.) It's ok if the strips are wider than the area, just let it hang off the bottom and trim it later like you did with the top and bottom pieces. After you've trimmed off any over hang fabric, the outside is finished. All you have to do now is cut two pieces of felt (I used pinking shears) to fit inside your tin, glue them in with the fabric glue, and you're done! Too cute, thanks for taking the time to show us your great idea. ack! such a cute idea!! and i think i still have some tins that i didnt give away!! would you mind if i linked to your tute on my blog? your tutes are great!!! i wonder if some mod podge or gel medium would protect the fabric??? I think the mod podge would be a great idea! Oh, but do you think you'd still feel the texure of the fabric? Thank you! I love easy and logical, and this project is both easy and logical. love this idea. where did you get your "altoid-like" tins? i tried to find some for some magnets i made to give as gifts but couldn't find any! This would make that gift even cuter. SarahJeanne, I bought my tins at this web address. Easy peasy! This is so cute! Wonderful idea for a travel kit. Might have to make some of these for Christmas Stockings. Thank you so much! Wonderful blog! What a super cute idea! I love this. Thank you so much...I love this idea.I used these tins to store my ear buds in , but never thought of covering them. Nice. I love your idea! I found it because Mark Lipinski linked to it. I look forward to seeing more cute ways to recycle "stuff." Very cute. 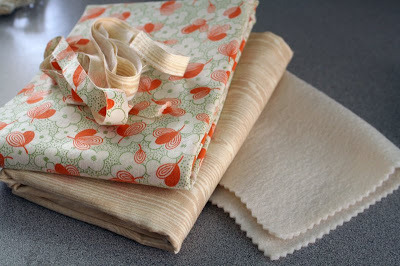 I think I would place the tin on top of fabric---then draw around it...then cut that out. I am lousy at cutting once something is on. Need to buy those tins. Oh what an amazing idea! Thank you soooo much! So cute! This is definatly one for me to do for a manner of things for myself and as gifts for others! Thanks so much for your cute tutorial! I posted this on my blog on the tutorial page. These are ADORABLE- Thank you for the idea and instructions! These are great to give gift cards in, or for a pill container for your purse! I've also made them but spray painted them & prettied them up with beads & other craft trinkets! I tried using different materials and it didn't work. Thanks for the tip and I will try again. I was trying to make a magnet needle holder case. I have given the altoid containers, and all that cool ducktape to my grandsons 7-14 and they made cool "army camo tanks",(by placing a small altoid container on top of the regular containter), wild "hotrod" "zoo",pink for girls.. the duck tape really works well on altoid containers. I have covered these with paper for my grandson. But the idea of fabric or duct tape adds a whole new dimension. 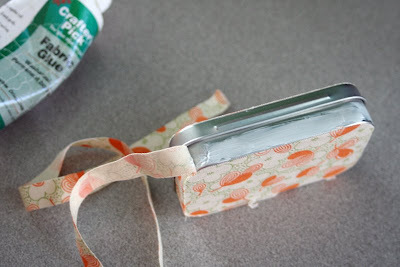 I keep a tin in my purse with almonds to eat when I'm running errands, get hungry and don't want to stop for fast food. Thanks for the great ideas. I use these when I do bead work. If you make one of the inside felt liners black and one white, the beads show up beautifully depending on their color. 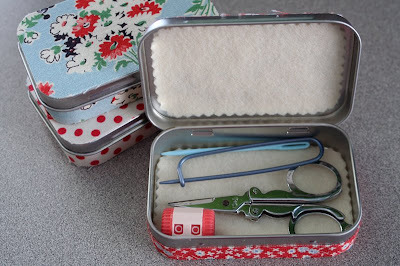 Leave your scissors and needles (which are secured in a small piece of felt)inside the tin and everything is set to go. Love to upcycle! Oh my, these are adorable! I have several Altoid tins but since they now come embossed on the top, I didn't think covering them would look too good. 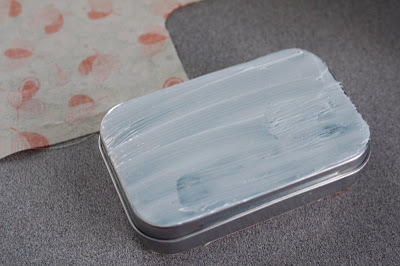 Did you use the actual Altoid tins, or some that you purchased that were smooth on top? I just today found your blog and look forward to seeing more of your projects. 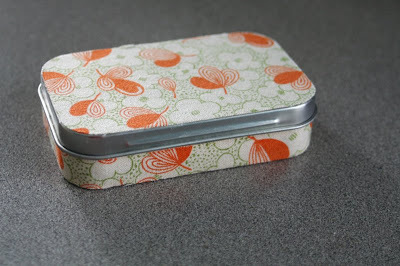 I love the idea for your altoid tins, so precious. I have been searching for tins for my pins, this should work fine. How do I get to your etsy shop? I will make these, putting a "book-like" set of felt (3 or 4)inside, after lining them and use them to hold earrings when I travel. I will need to experiment a little to get this right. I love your idea. I have quite of few of these times, because I save them when the mints are gone!!! Is there any other glue that will work? Thank you for the great tutorial. Now trying to get everyone I know to buy and use Altoids or anything in a tin box! What a great idea!Are u selling this?